“I knew that I was first but didn't know that I had made a new record in pole vault in the whole of Pakistan breaking all other previous records. I came to know about it from the newspapers the next morning." These are words from an ace athlete who has recently been recognised for his remarkable feats in sports. 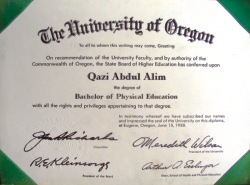 Qazi Abdul Alim is not only a legendary athlete but an expert in the field of physical training and also a writer. Recently the 70-year-old athlete received a UNESCO award and holds the title of being the first person to receive such an accolade in the south-east Asia and Pacific region. The UNESCO prize created in 2002, is attributed every two years to reward distinguished services to physical education and sport. But the story behind this remarkable personality is a lot more intriguing. 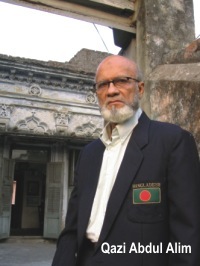 Born on December 31, 1933, Alim is the son of Qazi Badri and Mahsuda Begum of Rokonpur in Old Dhaka. Alim's childhood was rather uneventful, limited to school and home and of course "a little bit of sports". He played traditional Bangali games like gollachhut, cockfight, spoon race, etc. He went to St. Gregory's High School where he studied from Class I to IV and then moved to Jubilee School before finally settling in the Collegiate School from where he did his matriculation. It was after his matriculation that he decided to build up his career as a sportsman. He did not like cricket and neither did he have very sweet memories about his dabbling with football -- he broke his toe twice while playing the game. So he decided to be an athlete. "My father was a footballer. So, there was always a sporting environment in my family. Besides, time does not matter if one is determined and sincere to one's choice," says Alim about his rather unconventional decision. Alim took admission at Jagannath College. Besides studies, he started to give more time to sports and trained hard, following a stringent daily routine. After Fazr prayers he would run around Bahadur Shah Park a few times before going to Kabi Nazrul field. After coming back from college, he went to the Dhaka University field or in some other field of Old Dhaka. Practice continued until evening. Before long, his hard work began to produce results. It was in 1948 when Alim participated in 13 sporting events and became champion in Jagannath College's annual intra-university sports. The events were 100, 200, 400, 800-metre race, 2 relays, discus throw, shotput, javelin throw, high jump, long jump, pole vault. The following year he repeated his feat-- Alim stood champion again in 1949. He was also the athletic secretary for his two years in the college. "Weight training is the best exercise for any athlete and I used to do it on a regular basis," says Alim. 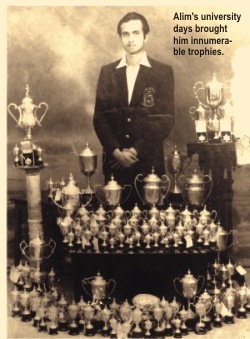 With a bag full of trophies, Alim got admission into Dhaka University through the players quota in 1949. After BA he did his post graduation in two subjects -- International Relations in 1954 and History in 1956. His educational expenses for both the MA degrees were borne by the university. In 1956 he got an Asia Foundation scholarship to Oregon University in the US. It was here that he studied physical and heath education, thus getting a proper grounding in his field. In addition, he completed another course on athletic injury and first aid from that university. In Dhaka University, Alim practised in the university gymnasium and regularly cycled. Another place he was a frequent visitor to was Modhur Canteen, where he used to have his breakfast. At Dhaka University he soon excelled in sports events. In 1951 he broke a new record in pole vault but while pole vault was his expertise, he also made his mark in the categories of running, high jump, hop, step and jump in which he became champion in the first year of his university life. Two years later he further pushed back the categories of sports he had so far been famous for -- in 1953 he became champion in gymnastics and boxing. He represented East Pakistan team as the Captain in the Pakistan games in 1955 (Dhaka) and 1956 (Lahore). From 1948 to 1956 -- nine years in a row -- he was East Pakistan's athletic champion. He also captained the Dhaka University athletic team in 1950. His passion for sports also influenced other family members. His constant support and inspiration helped three of his sisters -- Qazi Zaheda, Qazi Nasima and Qazi Shamima -- to enter the world of sports. He of course took it upon himself to train them. His efforts didn't go unrewarded -- all three of them became national and international athletes. All this was happening in the '50s, a time when the conservative attitude of society towards women made it extremely difficult for them to even dream of getting into the sports arena, let alone excel in it. But Alim's passion and his sisters' interest proved to be sustaining enough to defy any social disapproval. When asked how he dared to do so, he revealed that their father and the family were always supportive of their dreams: "Besides, I assured my father that I would take care of them." Alim's stint as a trainer was equally impressive as he was as he was such a dedicated sportsman. Coming back from Oregon, he joined as a coach in East Pakistan's athletic department. He was there for three years from 1958. He was the coach for East Pakistan in 1962, '66 and '67 Pakistan games. In 1962, he joined the Agricultural University as physical education teacher. He created many good athletes there. He worked there with total dedication and sincerity. Alim was in this university for almost four years. In 1965, the Pakistan Government built up a "Dhaka National Sports Training and Coaching Centre" in Dhaka. Alim was its first director and worked there for nine years. He founded a library there and enriched it over the years. The library is still there, though the name has changed to National Sports Council. He was the vice-captain for Pakistan in the 9th Edinburgh Commonwealth Games. 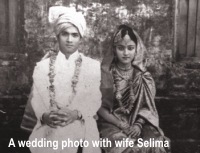 In 1961, Alim got married to Qazi Selima. There was no doubt that there were many female fans of the handsome 5'-11" athlete and a charming young man, but for him, Selima was the only woman in his life. Moreover, he kept all his concentration on sports. 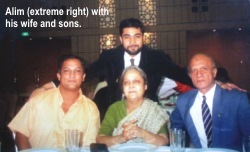 Alim and Selima had three sons. Their elder son died in 1980. In 1974, he was appointed the principal of Dhaka Physical Education College. This gave him the opportunity to completely change the culture of the college as far as sports was concerned. At that time, physical education was rather a neglected field. "Most often I used to be called PT Sir," says Alim. He worked very hard and spent all his time and energy throughout his 18-year tenure and changed the fate of the college. He built a swimming pool and introduced some new sports in the college. He was also the man to introduce sports song in the college. Alim also initiated scholarships abroad for the students of the college. From 1976-78 he was the general secretary of National Sports Control Board. From 1974-89 he was the president of Physical Teacher's Summit. He was also the vice-president of Bangladesh Cycling Generation. In 1979 Alim got a call from the president. 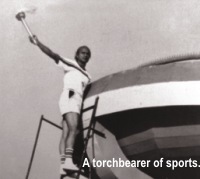 Zia was always in favour of the development of sports and games all over the country. One day he called Alim and asked him what could be done for the development of sports. Alim's proposal was to establish a national institute of sports like many developed countries. It was 1979. He also proposed that physical education should be made compulsory and that in every educational institution there should be a physical education teacher. Zia readily accepted his first proposal and asked Alim to start working for a national institute of sports. Once he had the government backing, Alim began his work and the Bangladesh Institute of Sports (BIS) was established in Savar on 100 acres of land. He was the first director of this institute and graced the post for three years. BIS was later turned into Bangladesh Krira Shikkha Protishthan (BKSP). But is BKSP on the right track and taking our sports forward? Is Alim happy with the state of BKSP? "No, I am not happy. Because today BKSP is full of corruption." In 1982 he joined the Physical Education College again. He retired in 1989. Alim believes that it is important for the government to be actively involved in helping to identify and pick athletes from across the country. There is also another more cerebral side to Alim. He has written some 42 books, 18 of which are on physical education. The rest are fairy tales, short stories and books on traditional Bangla proverbs. Thirteen of his books are yet to be published including his autobiography called Smritikatha. His first book titled Daud-Jhanp-Nikkhap was published in 1960. One of his most popular books is Bani Chirontoni. It had more than 20 editions. He is also the first editor of sports magazine Krirajagat. Alim has travelled many countries, sometimes as a sportsman and sometimes as a sports organiser. In 1956 he went to the US for higher studies; in 1977 he travelled to Russia as the leader of a five-member Bangladesh group; he went to Bulgaria to attend the 5th World University Games as the manager of Bangladesh athletic group. He went to Delhi to attend the special general assembly of Olympic Council of Asia in 1991. In 1994 he went to Hiroshima to participate in the Asian Games as the deputy chief of the mission. His last foreign tour was to Athens on 6th December 2004 to receive the most prestigious award of his life -- the UNESCO Award. 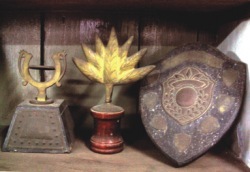 Alim, in fact, has received many awards for his remarkable achievements. As a top athlete of Dhaka University he received the gold medal by chancellor WA Zenking. He also won the national sports award in 1977 for his contribution to sports, the Qazi Mahbubullah gold medal. For his widespread contribution in sports he got the "Shadhinota Padak" in 1993. A total of 49 countries participated in UNESCO Award winning competition, including Russia, Japan, China, India Australia, Sri Lanka and Pakistan. Qazi Abdul Alim of Bangladesh won it. Asked what won him this award, he answered that most participants were athletes or players only. I was the only one who was a physical trainer as well as a writer besides being a player. Here I was different from others." His being a physical education trainer and a successful athlete and his contribution to athletics and physical education in the entire sports sector of Bangladesh were the key factors for the jury to select him for the award. Alim received a medal and diploma. "It has been a long journey from 1945-2004," says Alim. "It has come late but it has come at last." Alim in 1971 played the role of a different type of freedom fighter. From NSC he trained the "Bicchu Bahini". After training he would give them arms and ask them to "Go fight for the country". Alim was fluent in Urdu and the Pak army never suspected him. Alim has a very cool, quiet and calm personality. He is a little on the reserved side. Before retiring in 1989, he had been transferred to Rajshahi Physical Education College, perhaps for being too principled and strict about rules and regulations. But the ever youthful Alim still has a lot to contribute in the field of sports. In terms of developing a sports culture in this country, people like Alim are invaluable. Recognising him for his achievements and honouring his vision is our duty. Whether he gets what is due to him or not, there is no denying the fact that Qazi Abdul Alim will always be a distinguished figure for his outstanding performance and contribution to sports.